I don't consider myself to be a gourmet cook, but I do enjoy well prepared and beautifully presented meals with high quality ingrdients. I subscribed to Food & Wine for the first time in 2009 and although I've attempted few recipes from this magazine, I'll be renewing my subscription in 2010. As much as I love to cook (and eat), I don't have time for elaborate meals on weekdays. Almost everything in this magazine is elaborate. But, OMG, it's just so... beautiful. The wines, the cookware, the fine cheeses, the advertisements for luxury cruises. Reading this magazine is like a fantasy. I love recipes that challenge me and Food & Wine is full of them. I think I'll "grow into" this magazine. As I've mentioned before, I have a huge collection of recipes clipped from various magazines that just sit in a disorganized pile on our file cabinet waiting to be scanned. Fortunately, Food & Wine has a website where I can locate recipes from previous issues, so I can just have an electronic recipe file and recycle or share my old issues of the magazine. That's always a bonus and I wish every magazine would do this. I did attempt the Pull-Apart Cheesy Onion Bread and I really enjoyed it. The recipe is a bit confusing, so I improvised. The result was a buttery, cheesy, savory biscuit-like loaf of bread. One slice was more than enough! The leftovers were great reheated. My hubby didn't enjoy it because he's anti-onion and a bit picky about cheese. 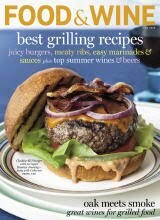 If you are broadening your cooking horizons, I recommend Food & Wine. If I had more time (and money) I'd attempt more recipes from this magazine.